Background: The pilot project Open Doors for Danube Countries for All (ODDA) builds on experiences from the previous work and projects of the network Danube Networkers. Mutual knowledge and understanding amongst people in the Danube countries and positive climate between European neighbours is one of the prerequisites to the successful implementation of the Danube Strategy and its European ideas. The project should help to reduce prejudices and fears, to introduce and establish new role behaviours and forms of civic engagement. Experiences from previous cross-national projects have shown that many people are reserved when it comes to programs that include international meetings or travel to the West or the East. This applies especially to people with low education, but also to people, who have large knowledge about their own culture. This reserve comes from the lack of knowledge of languages – the other national languages or English, the lack of experience with the cultures of the Danube neighbours and the resulting fear of getting into difficult situations. The reason for this is the long division of the West and the East Europe and the different social systems. The consequences of this division are especially marked in the transdanubian sphere. Cross-national meetings foster motivation to find out more about the ‘world’ of the other, lead to questions and experience of alternatives for dealing with new situations and foster the feeling for common European democratic values. The reason for this is the long East-West divide in Europe and the different social systems. The very successful, intergenerational and intercultural Danube Project „Tastes of Danube: Bread. 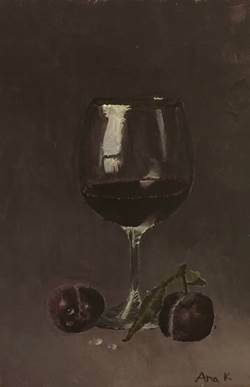 Wine. Herbs“ will be continued. The follow-up project „Tastes of Danube-Bread Connects“ is based on the findings and experiences in the project „Tastes of Danube-Bread.Wine.Herbs“. 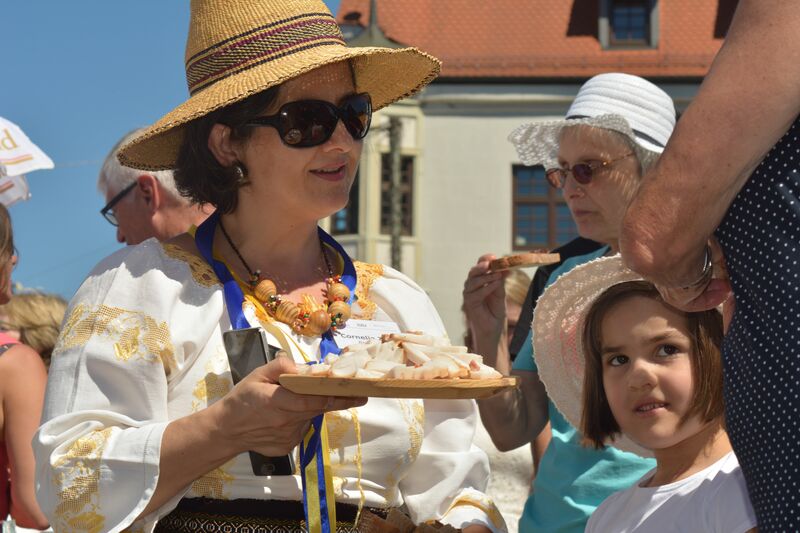 At the heart of the project „Tastes of Danube: Bread Connects“ is the promotion of awareness raising for the common cultural roots in the Danube Region and in Europe and the strengthening of the Danube community by working on the subject of bread. Through various activities, citizens of all age groups, ethnic groups and social situations will be invited to experience bread as a common immaterial cultural heritage, which is reflected in many facets of local level. Through doing things together at local and transnational level, the aim is to demonstrate the possibilities offered by the cultural heritage of intergenerational and intercultural dialogue, social cohesion and economic development in the Danube Region and in Europe. Jointly organised by Slovenian Third Age University and the local Cultural Centre,the 4th International Festival of Knowledge and Culture in lLter Life took place in Šmarje pri Jelšah, a Slovenian country town. Through the day the audience followed the programme staging results of exploratory learning of older people that shape local identity and support the development of cultural tourism all over Slovenia, but also in Croatia and Austria the two neighbouring countries. Old tales of the region were collected and acted out, EU projects proved to have brought new educational and cultural topics into older adult education. The results of My story, 18 summers, RefugeesIn , Silver Code, P3AE were presented. Šmarje pri Jelšah is known for its baroque church etc. Study tours were organised. Was presented also Bread in the past and present, a sociological, economic, political and cultural study of bread, a publication originally prepared by a group of U3A’s students of journalism for the DANET’s project Tastes of the Danube. The 7th Newsletter (March 2017) of the “Danube-Networkers for Europe (DANET) e.V.” is now online! Has the project The Tastes of the Danube become trully intergenerational? Ana Kovačič, a thirteen year old girl called on us. She appeared profoundly interested in the project. She was shown around the exhibition Bread in the Past and Present which has recently been opened to the public at Slovenian Third Age University. She said that she was more attracted by the topic of wine than that of bread. Suddenly she went to her rucksack ,pulling out a picture. Allegedly she had never made a painting before.The colours of the picture remind us of some 19th century paintings. We think Ana is very gifted and we gladly accepted her as a member of our project. Tastes of the Danube. Tatjana Rodošek, student at Slovenian Third Age University awarded. Association DANET extended a call for projects to various organisations along the Danube. The call yielded results. Slovenian Third Age University contributed its web publication of the study Bread in the past and present and a catalogue of paintings featuring bread. Moreover, recently there was official opening of the exhibition The story of Bread displaying selected paintings and drawings produced by Slovenian Third Age University students and their mentors. Upon the opening of the exhibition and a short lecture,Tatjana Rodošek, winner of a photo competittion launched in Ulm was awarded for her photo of a little boy getting enthusiastic over a loaf of bread. “It’s mine, it’s mine he cried” said Tatjana. The ILEU office in Ulm started in November 2016 the action “Christmas Packages along the Danube” and invites all interested partners to take part to it. Packages in the size of a shoe box will be prepared and sent to other partners from three different Danube countries. They should contain Christmas cookies (sweet bread) and recipes, descriptions of Christmas customs and information about the own group (who we are) in the native language and in English. The 6th Newsletter is online! 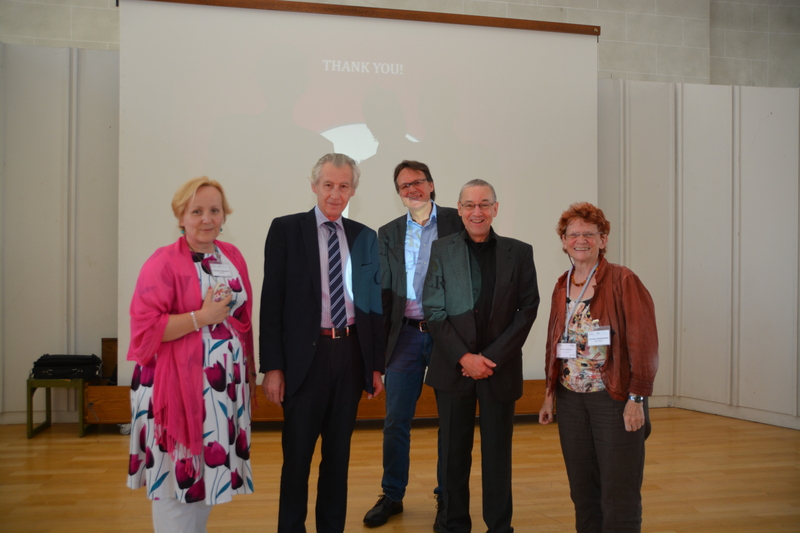 In May 2016 the University in Reims hold the world conference on “History and Development of the UTA in the world” and hosted participants from the AIUTA International Association. The conference was combined with the AIUTA98th Governing Board meeting and AIUTA General Assembly. During the last year AIUTA approved the application for the membership from National University of the Third Age in Sofia, Bulgaria, From U3A in Ulaanbaatar, Mongolia, Tomsk State University U3A, Russia and A Coruna Senior University in Spain. The AIUTA 99th Governing Board meeting and International Conference was organised from 10th to 12th October 2016 in Osaka. The theme of the conference was “U3As Linking the World – Active & Healthy Ageing & Intergenerational Cooperation”. Program of the conference focused on many different topics with the presentations of Mr. François Vellas on behalf of AIUTA, Mrs. Rhonda Weston on behalf of Asia Pacific Aliance, Mrs. Akiko Tsukatani on behalf of Age Concern Japan and Japan’s U3A Federation, Mrs. Wang Younong & Mrs. Zhong Haoling, China Association of the Universities for the Aged, Mrs. Nadežda Hrapkova, Comenius University, Bratislava, Slovakia, Mr. Hans Kristjan Gudmundsson, U3A Reykjavik; Mrs. Nelly del Forno, U3A Lignano Sabbiadoro Italy;, Mr. Armoogum Parsuramen, U3A Mauritius; Mr. Carlos Santos, Azores University, Portugal and many others. Panel discussion have had the panellists from France, Australia, Mauritius and Slovakia with the facilitator Rhonda Weston (Australia) on“U3A co-operation world-wide“. The organisers from Osaka U3A and Asia Pacific Alliance offered the participants after the conference trip to Kyoto and meeting with the elderly students. The 100th AIUTA GB meeting in Bratislava (Slovakia) May 2017; 101st AIUTA GB meeting La Mesa Bogotá (Colombia) November 2017; 102nd AIUTA GB in Barcelona (Spain) June 2018; 103rd AIUTA GB Port Louis (Mauritius) October 2018. Additional proposals for the presentations of AIUTA have been agreed by the president prof. François Vellas for the fair of Seniors Art Expo and Senior Tourism 2016 – 2018. The 100th AIUTA GB meeting is going to be held in Bratislava (Slovakia) at Comenius University on 18th May 2017. The meeting will be combined with the conference on theme “Equal opportunities for learning of the elderly” on 19th May 2017 and cultural trip on 20th May 2017. 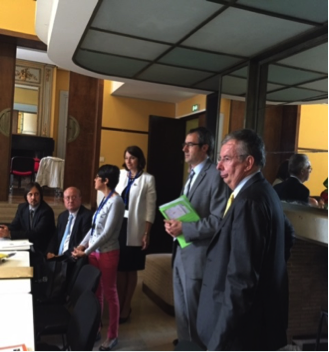 In May 2016 the University of Reims hold the world conference on “History and Development of the U3As in the world” and hosted participants from the AIUTA International Association. The conference was combined with the AIUTA98th Governing Board meeting and AIUTA General Assembly. During the last year AIUTA approved the application for the membership of the National Third Age University, Sofia, of U3A based in Ulaanbaatar, Mongolia, Tomsk State University U3A, Russia and A Coruna Senior University in Spain. The conference programme was focused on a greta number of different topics with the presentations given by Prof. François Vellas on behalf of AIUTA, Mrs. Rhonda Weston on behalf of Asia Pacific Aliance, Mrs. Akiko Tsukatani delivered a presentation on behalf of Age Concern Japan and Japan’s U3A Federation, Mrs. Wang Younong & Mrs. Zhong Haoling, China Association of the Universities for the Aged, Mrs. Nadežda Hrapkova, Comenius University, Bratislava, Slovakia, Mr. Hans Kristjan Gudmundsson, U3A Reykjavik; Mrs. Nelly del Forno, U3A Lignano Sabbiadoro Italy;, Mr. Armoogum Parsuramen, U3A Mauritius; Mr. Carlos Santos, Azores University, Portugal and many others. Panel discussion have had the panellists from France, Australia, Mauritius and Slovakia with the facilitator Rhonda Weston (Australia) on“U3A co-operation world-wide“. The organisers from Osaka U3A and Asia Pacific Alliance offered the participants after the conference trip to Kyoto and meeting with the elderly students. The 100th AIUTA GB meeting in Bratislava (Slovakia) will take place in May 2017; 101st AIUTA GB meeting is planned to be in La Mesa Bogotá (Colombia) November 2017; 102nd AIUTA GB in Barcelona (Spain) June 2018; 103rd AIUTA GB Port Louis (Mauritius) October 2018. Additional proposals for the presentations of AIUTA have been agreed by the president Prof. François Vellas for the fair of Seniors Art Expo and Senior Tourism 2016 – 2018. The 100th AIUTA GB meeting is going to be held in Bratislava (Slovakia) at Comenius University on 18th May 2017. The meeting will be combined with the conference on theme “Equal opportunities for learning of the elderly” on 19th May 2017 and cultural trip on 20th May 2017. RefugeesIn is being developed as an ERASMUS+ key activity 2 project co-funded by European Union and coordinated by AidLearn, Lisbon. The project is a natural continuation of the finished CINAGE, European film for active ageing project. In current social circumstances and using the analogy approach, the CINAGE partners got an inspiration for the RefugeesIn. The analogy could not be clearer since in our societies older people are approached through stereotypes and so are refugees. Stereotypes being handy, developing our own standpoints and attitudes does not seem to be needed since it is so easy to believe and repeat what is told and may be heard around us. It is safe to remain within »the conceptual tunnel« ( cf. Boris Cyrulnik), abiding by what our cultural or social group says, missing checking the validity of the words heard, looking upon refugees through the prism of either negative or positive stereotypes. In the absence of reasonning, we go on nurturing our fear of changes. Between Europe and the Islamic world- the world of refugees- there has been a rich and complicated history of conquests and defeats, re-conquests and diplomacy, alliances, trading, translating, transferring technology, but also imitating arts and culture. These contacts have impacted the history of European and Muslim nations. The images of certain Islamic heroes spur the imagination of the Europeans, preventing them from understanding the Islamic world which has contributed to Europe’s consolidating its own identity. What: In the project partners and the target learning audiences will learn how to write scenarios, directi and edit documentary films using archive sources, transmitting the truth stripped of propaganda, passing on the truth, be it only one single truth, the truth of the author of the film. Methods: partner meetings, focus groups, a course on making documentaries and understanding the refugees’ issues, conferences, round tables, radio programmes, articles on who refugees are and how they get included in our culture and how we get included in theirs. NO BUDGET BUT GREAT IDEAS? ALDA CAN SUPORT YOU! */ALDA supports initiatives promoting active European citizenship. Take a chance and build your project! ALDA – the European Association for Local Democracy – continuously supports activities in the field of active European citizenship. In this perspective, ALDA calls for proposals of *initiatives taking place from 1 September to 31 December 2016. The applications should be committed to the advancement of ALDA’s main goal – *promoting good governance and citizen participation at the local level in Europe*. Eligible activities must strengthen the active involvement of citizens on the most current issues on the EU agenda and contribute to an ever-integrated European Union. On the 10th of July 2016, following the Conference, a Danube -Breakfast took place at the Herdbrücke Ulm/Neu-Ulm, a bridge connecting by the Danube the towns of Ulm and Neu-Ulm, the states Baden-Württemberg and Bavaria and also Germany with other Danube countries! Partners from the project Tastes of Danube and guests from all Danube countries met citizens of different ages, ethnic origins and countries living in Ulm Region and spoke about their everyday life, their cultures, their interests and experiences. We want to thank all the numerous visitors, the table sponsors and the helpers! It was a special breakfast under the blue sky at the Herbrücke Ulm/Neu-Ulm above the Danube. On 8th of July took place in Haus der Begegnung Ulm in the frame of the 10th International Danube Festival the conference Tastes of Danube: Let’s taste it. The conference programme included a number of plenary lectures, which provided scientific background as well as practical approach to the main themes in transnational comparison. Different methodical approaches were presented. Potential future projects in the areas of lifelong learning, cultural education, sustainable tourism, social entrepreneurship and other subjects were discussed in working groups. At the conference participated 135 people from all Danube countries. We provided simultaneous translated English-German and German-English for the introduction and keynote lectures! Slovenian Federation of Societies of Pensioners hosted the annual EURAG conference in Ljubljana. The topic of the conference was very topical and timely. It was about organisations of older people and for older people and their effectiveness in society. Older people still suffer from socio-economic injustice (in Latvia they have a very low pension in Israel several million people are without any pension) and they suffer from injustice on the cultural and symbolic level (ageism). Nevertheless, in the times of recession and social transformation, older people’s issues and their cooperation with other generations are attracting less attention and our organisations have to be even more vigilant and active to keep focus on older people’s abilities and challenges. Not only older people experience social transformation and therefore EURAG’s (and our) focus is to be shifted towards life span ageing and life span approaches to ageing. Speakers at the conference underlined that older people are not (at least the majority of them) in the need of help. They have a lot to give and this should be made possible through policies and different organisations etc. EURAG particularly appreciates its bonds with Social Platform which is concerned with different social groups.